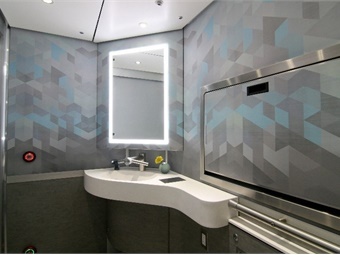 Florida-based Brightline, the privately-funded express passenger rail system connecting Orlando with Miami, unveiled the first look at its locomotive and passenger coaches, including key features of the car interiors. 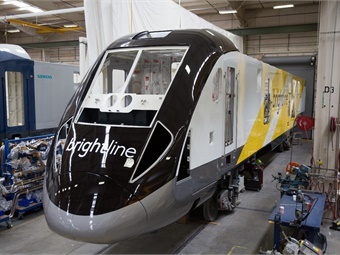 At the Siemens facility in Sacramento, Calif., where the trains are being constructed, Brightline revealed its first completed locomotive shell, constructed of carbon steel. The Charger diesel-electric locomotive has a distinct angled, sleek nose. 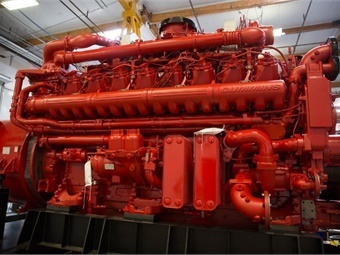 A fuel-efficient Cummins diesel-electric engine built in the heart of Indiana will power the locomotive with 16 cylinders pumping up to 4,000 horsepower for optimum reliability and consistency. The lightweight engine is certified to meet the ultra-low emissions required by EPA Tier 4 standards, with additional benefits including reduced noise and excellent response, according to the company. Brightline is the first fully accessible train, exceeding ADA compliance standards and addressing the needs of guests by providing end-to-end mobility for all travelers. 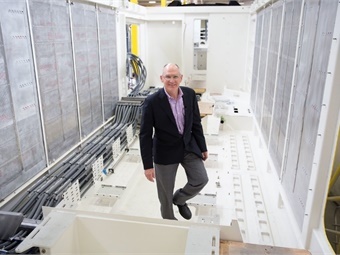 To do this, Brightline trains feature level boarding, utilizing retractable platforms that are integrated into the train car door systems. Prior to the doors opening, the platforms will extend up to 12 inches from the train and pivot to create a flush surface for passengers to cross, making it easy for those with mobility challenges, pushing strollers or luggage to board Brightline. 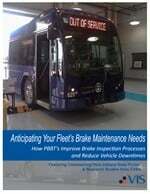 Each coach will also include a spacious restroom that features universal access and a touchless environment. The sink is integrated into the vanity area that also includes a large back-lit mirror and a faucet that both rinses and dries. Changing tables are recessed into the wall and when opened offer ample space. Hooks for bags and coats have been thoughtfully placed for maximum convenience.